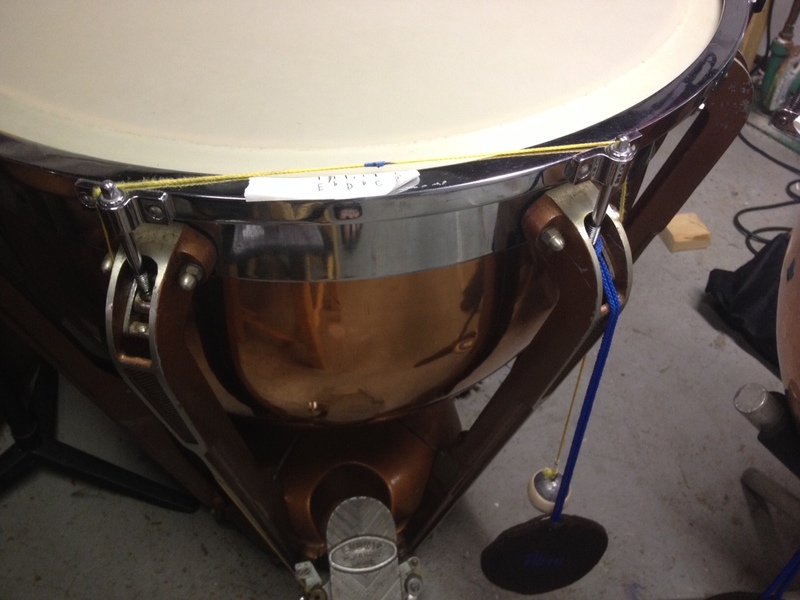 My Ludwig Dresden timpani came without tuning gauges, but it hasn’t been a problem. I’ve been using string timpani gauges, or as I like to call them, GravityGauges®, for many years. These are simple tools that let you avoid expensive and often inaccurate mechanical gauges, drilling holes in your drums and other unpleasantness. 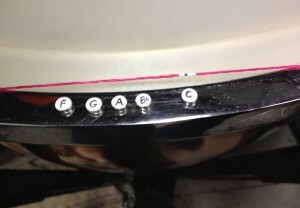 The traditional method is to tie or tape a piece of string (I use nylon masonry line) to your drum’s pedal and then drape it over the two tuning lugs in front of the drum. The string is weighted, that’s the gravity part; I use eight ounce lead fishing weights with moleskin wrapped around to minimize any noise. 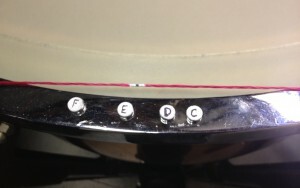 A mark on the string moves across the tape to indicate the pitch. (See fig. 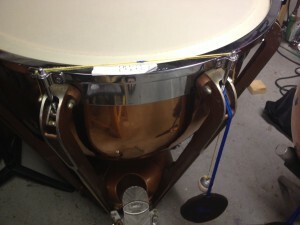 1 – 26″ drum) The tape is functional, but funky and has to be replaced often. If you click on the pic to enlarge it, you can see how I’ve added new lines to account for the inevitable drift of the notes. Also, the tape loses its stickiness and can leave a gummy residue on the counterhoop. Lately I’ve come up with a better solution: magnets! It seems pretty obvious in hindsight, but it had never occurred to me before. I ordered thirty small industrial magnets from Amazon and got to work. I decided to paint them with a flat white primer and then hand draw the letters with a fine Sharpie. I could have ordered vinyl letters but they would have to be very small and also, I didn’t want to wait. Here’s how they look on my 29 inch drum. It’s not a perfect world, as you can’t get the magnets too close to each other as they are very strong and will jump together. That’s why I don’t have accidentals between the notes. I don’t mind this, as the accidentals are generally halfway between the whole tones. Note that I’ve used Bb. 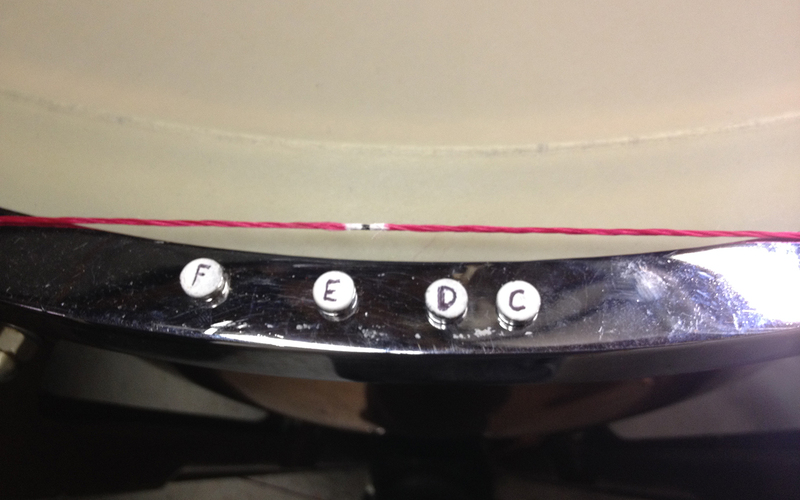 I find it’s more often used than B natural and it’s not too close to the C.
Here is how they look on the 26 inch drum. On both drums the high notes are on the inside and the low notes are on the outside. I’m very happy with my new and still very cheap gauges. They are easily adjustable, don’t leave a residue and don’t move when you don’t want them to. If you don’t have gauges and don’t want to spend hundreds of dollars on them, this is the way to go.